Amazon.com today announced the launch of Kindle Textbook Rental. The new service lets students save up to 80 percent off textbook list prices by renting from the Kindle Store. Amazon says tens of thousands of textbooks are available for the 2011 school year from leading textbook publishers such as John Wiley & Sons, Elsevier, and Taylor & Francis. Kindle Textbook Rental lets you customize rental periods to any length between 30 and 360 days, so students only pay for the specific amount of time they need a book. Students can also easily extend any rental period in increments as small as one day. Last but not least, at any time they can choose to purchase the book they are renting. The US Kindle Store now has more than 950,000 books, including New Releases and 109 of 111 New York Times Best Sellers. Over 790,000 of these books are $10 or less, including 69 New York Times Best Sellers. Millions of free, out-of-copyright, pre-1923 books are also available to read on Kindle devices. 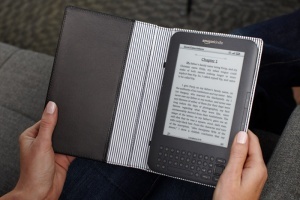 Two months ago, Amazon announced that Kindle books had begun outselling print books. Arguably the best part of the Kindle ecosystem is Amazon's Whispersync technology. It saves and synchronizes your full library of books, bookmarks, last page read, highlights, and annotations across all of your Kindles and Kindle apps for the Mac, PC, Android devices, BlackBerry, iOS, Windows Phone, and soon HP TouchPads and BlackBerry PlayBooks. "Students tell us that they enjoy the low prices we offer on new and used print textbooks. Now we're excited to offer students an option to rent Kindle textbooks and only pay for the time they need-with savings up to 80% off the print list price on a 30-day rental," Dave Limp, vice president of Amazon Kindle, said in a statement. "We've done a little something extra we think students will enjoy. Normally, when you sell your print textbook at the end of the semester you lose all the margin notes and highlights you made as you were studying. We're extending our Whispersync technology so that you get to keep and access all of your notes and highlighted content in the Amazon Cloud, available anytime, anywhere – even after a rental expires. If you choose to rent again or buy at a later time, your notes will be there just as you left them, perfectly Whispersynced."